Summary: Both slaves and free gathered each Sunday in Congo Square, the only place in New Orleans where slaves were allowed to meet. After working all week, Sunday afternoons were a celebration, with music and dance that reflected the participants’ African heritage. The story of Congo Square is told in rhyming couplets, illustrated with folk art style paintings. 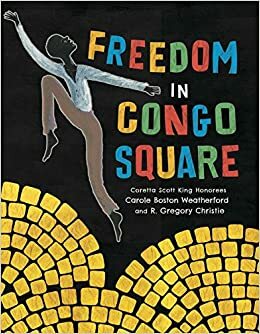 A foreword by historian and Congo Square expert Freddi Williams Evans and an author’s note both explain the history behind this book. 40 pages; grades 1-3. Pros: The grueling work of slavery is depicted in both the text and the illustrations, with allusions to beatings and escape attempts. In contrast, the Congo Square scenes radiate joy and celebration. Cons: The foreword and author’s note seem somewhat redundant.